Thanking Elizabeth for this genius costume idea – going to wear it to a Halloween party on Thursday! BaubleBar has some amazing statement earrings right now – I have my eyes on this pink pair and this blue pair. Gorgeous! Kate Bosworth’s collection for Topshop just launched and it’s incredible! The pieces are more streamlined and modern than typical Topshop pieces (which I adore). This tunic and these pumps are on my wish list! Love the bracelet and sunglasses ! Great finds! Kate’s booties remind me of the Vince ones, so cute. Love #5 it looks so cozy. 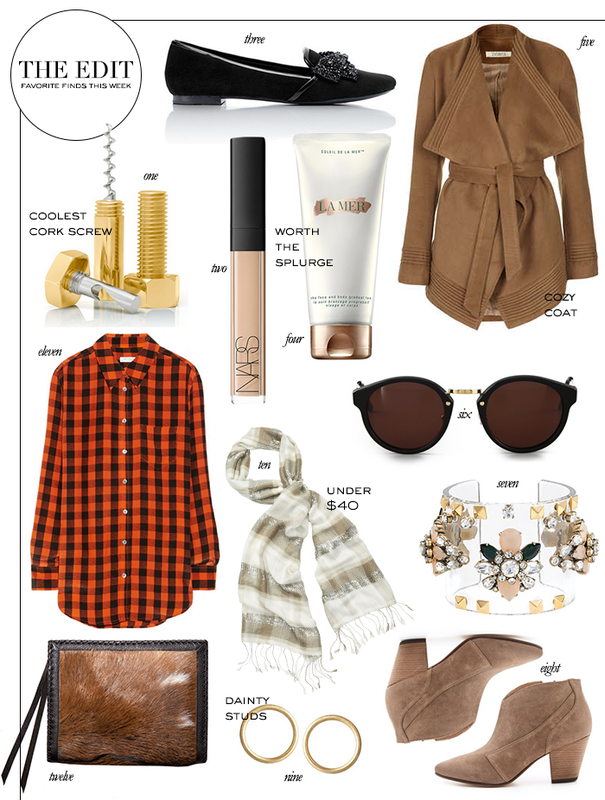 Love the wrap coat & jeweled cuff – great picks! so many good pieces! i particularly love that topshop coat! I want to cuddle up with that jacket, plaid, and scarf right now! It’s freezing! I literally just ordered those Tory Burch smoking slippers and can’t wait to get them. The bow is the perfect detail! Okay, so the coat, I’ll take. The corkscrew is the coolest. And the bangle, well, that’s on my “CRAVING” this week. Love your picks! That corkscrew is too cool! That coat looks so cozy and warm! Might have to buy it for my upcoming trip to NYC! I wish my bank account would allow for that coat…I wouldn’t take it off. Great pics! I am following you on blog lovin. I would love it if you followed me back! Love these picks. I can’t wait to check out the KB x Topshop collection! Great picks! Love that scarf and the fact that Tory created a home collection. That camel, suede coat is TOO DIE FOR! Hello Christmas list! That coat…so beautiful! And I love anything with calf-hair or fur!! Loving this list!